Challenge: promote brand, usage and retention of regional mobile phone provider. Strategy: position brand as good will ambassador demonstrating community support through development of special free event open to public. Generate buzz along with pre- and post-event publicity. Result created summer beach event, partnering with state travel and tourism department. 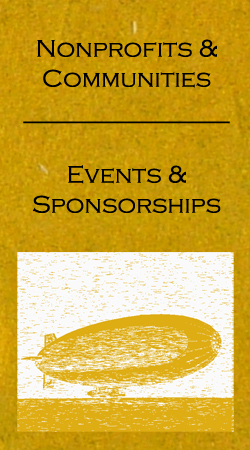 Sponsor signage, branded giveaways and awards to participants. Ninety days of pre- and post-publicity generated press statewide and in dozens of local communities. Challenge: develop corporate sponsorship and branding opportunities for local and regional companies, nonprofits and civic organizations. Strategy: create opportunities through a free 3-day food and music event created by developing a partnership between a music foundation, a chamber of commerce, and corporate and local sponsors. Generate buzz for event with name artists and pre- and post-event publicity. Result event created special marketing opportunities, with signage and other brand opportunities in front of 100k+ attendees; developed broad media attention, on-site sampling, customer acquisition and more. Measured attendee satisfaction scored high each year as the event grew in size and scope. All the original participating partners prospered.